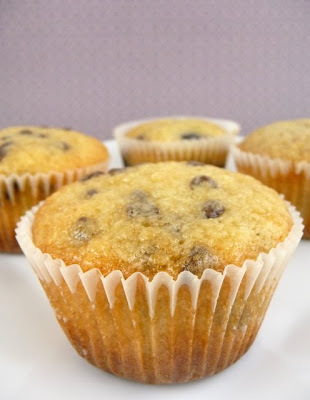 I’ve had this recipe bookmarked for awhile – I mean a pancake in a muffin cup – why didn’t I think of this?! It’s ingenious! I made two types of these – blueberry and mini chocolate chip. I can’t decide which one I liked better. These are perfect for a quick breakfast-to-go or for a nice brunch. Enjoy! 1. Preheat oven to 375 degrees F. Line muffin pan with paper or foil liners. 2. Melt butter in a small saucepan over medium heat. Melt and cook down the butter until little brown bits appear in the pan. The crackling will subside and butter will begin to brown fairly quickly after that. Remove from heat at this point and let cool slightly. 3. Whisk milk, egg, yolk, maple syrup, and vanilla until combined. Add the brown butter and stir to combine. 4. Whisk together flour, sugar, baking powder and salt in a medium bowl Add milk and butter mixture all at once and stir gently to combine. 5. Divide the batter among muffin cups and spread evenly. 6. Bake until golden and crisp and a wooden pick inserted into the center of a muffin comes out clean, about 18-20 minutes. 7. While the muffins are baking make the maple glaze. 8. In a small saucepan simmer maple syrup and lemon juice, stirring occasionally, until reduced to a thick syrup. This will take about 15 minutes over a low flame. 9. Remove from heat and wait for the muffins to finish baking. When muffins are out of the oven and cool enough to handle, poke a few holes in the muffin top with a toothpick. Brush glaze on top of each muffin and repeat until you use all of the glaze. That's really interesting...pancake in a muffin. Looks very delicious. These look divine... I can't wait to start baking! Thanks for the recipe!